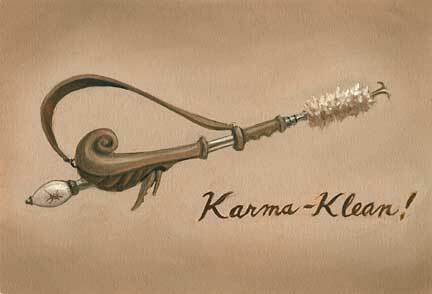 The Karma Klean spider web removal wand is a good example of the kind of practical yet thoughtful product that has earned Mr. Camembert a reputation in the home appliance industry. The Karma Klean efficiently eliminates spider webs from even the hard to reach areas of one's home or workplace while gently capturing the spider for later repatriation outdoors. According to no less an authority than the Lipschitz Report, “the Karma Klean is the #1 spider web removal product used in Buddhist monasteries worldwide and will provide consumers of all religious persuasions years of guilt free cleaning at a modest price."